For kids 12 and younger. Free set of antlers provided! Sleep in and still get a shirt! NOTE: This is NOT an event registration. You will recieve a sweatshirt if you sign up to volunteer. Long-sleeve shirts are only guaranteed with a registration date of Nov 27th, we will do our best for registrants that register after this. 5K 3.1 miles out and back on city roads. The course will start and finish at the Civic Center, located at 127 South Cody Rd, We will start in the Civic Center parking lot run along front street, up jones, to 15th and then turn around and go back down jones to front st and back to the Civic Center for an after party. There will also be parking available on the levee this year and restrooms by the start/finish line. 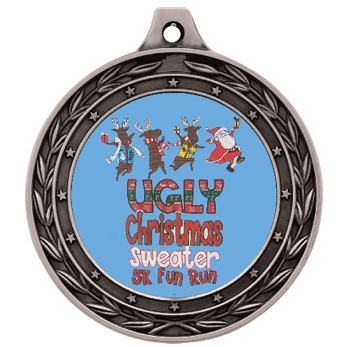 Overall top three male, overall top three females, and top three in each age division will receive a prize. We will also be giving a prize for the ugliest sweater and an ugly sweater runner up. Proceeds from the event will provide funding for Food For Thought, a non-profit organization that feeds the less fortunate of the quad cities area once a month. For event related questions, please click on the "Contact the Organizers" button on the left-hand side of this page. When this page loaded, the official time was 6:53:27 AM EDT.